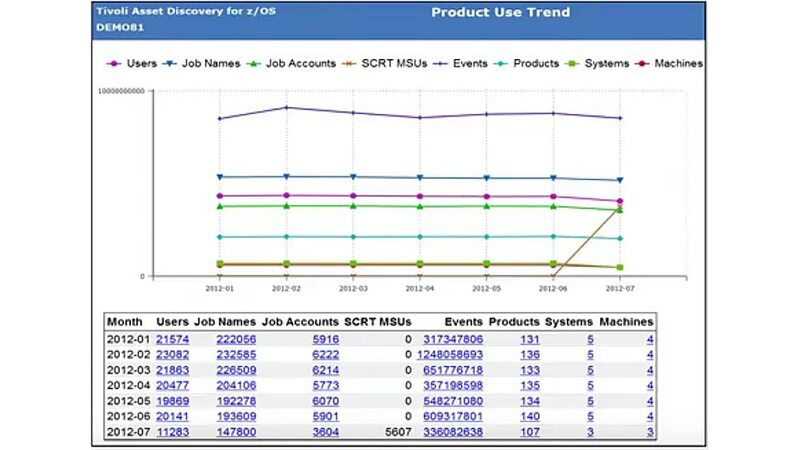 IBM Tivoli® Asset Discovery for zSystems® provides asset discovery, monitoring and reporting to understand IBM Z and third party product and application usage. You can use it with Tivoli Asset Management for IT to manage the full-life cycle of hardware and software assets including software license and contracts management. TADz also allows you to avoid license compliance violation penalties by providing a full audit trail to track usage and enable effective license management. You can also add IBM Tivoli Asset Discovery for Distributed for an end-to-end software asset management solution. Get automatic discovery and identification of IBM and third-party software running on the IBM Z platform. Enables improved performance in operational jobs and reduction in database disk space requirements. Monitor software usage and related growth so you can proactively plan for future capacity needs. Lower costs by removing unused and obsolete software.